Ani seems to have the perfect life-- she's an editor at a magazine in Manhattan, she lives with her stockbroker fiance, she has a perfect body and perfect clothes and is planning the perfect wedding. But the veneer of perfection is thin, and underneath that perfect exterior is Tiffani FaNelli, the girl she once was-- the chubby insecure girl whose mom talked too loud and whose parents never had enough money for her to really fit in at her private school in Philly. Although Ani would say she has risen above her past (and we learn more about the dark secrets of that past as Luckiest Girl Alive unfolds), but she is not happy. In fact, the book opens with visions of Ani stabbing that perfect fiance with knives from their wedding registry. 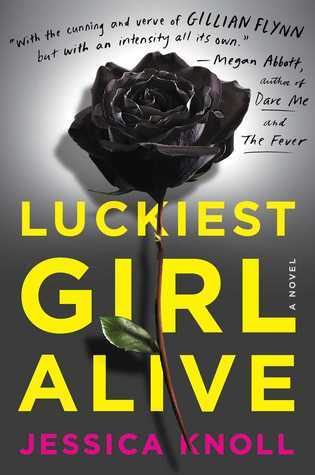 I know that Luckiest Girl Alive is getting mixed reviews. Ani is an unreliable narrator, and she's pretty unlikeable too. While Knoll worked as a writer for the same kinds of magazines that Ani writes for, I don't think she made Ani unlikeable by coincidence. She name drops. She's obsessed with brands and with keeping herself thin. She's marrying a guy who seems more like an accessory than a partner. All in all, she's kind of a nightmare. She was a nightmare fifteen years ago, when she started at the Bradley School too. But Knoll does a great job making readers interested enough care about his damaged girl, and then lays out a harrowing, totally compelling story of what happened to Ani during that pivotal freshman year. I can't tell too much without giving things away, but this book is full of twists and turns, and deals with issues far more important (like sexual abuse, school violence, and class issues) than having the perfect boots for the season.